The Old Foodie: To the Women of the United States. 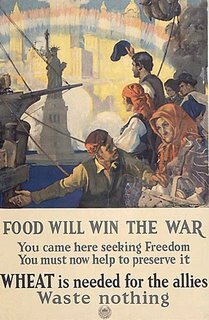 When the United States entered WW I in 1917, Herbert Hoover was made Food Administrator, and his catch-cry was “Food will win the war!”. There was no doubt that the responsibility for this part of the war effort would fall to the housewife, and on May 5th 1917, Secretary Houston of the Department of Agriculture made an appeal “To the Women of the United States”. In stirring patriotic prose, he urged every woman to “help to feed and clothe our armies and help to supply food to those beyond the seas by practicing effective thrift in her own household”, and to “Make economy fashionable lest it become obligatory”. Stirring patriotic prose to assist housewives “to make of the housewife apron a uniform of national significance” also appeared in cookbooks such as “Daily Menus for War Service” (1918) by Thetta Quay Franks. The book included three alternative “war menus” for each day of the year – more expensive, medium price, and cheaper – with recipes to help cater for meatless, wheatless, and porkless days. Broiled salt mackerel, Boiled potatoes, String beans, Quaker muffins, Oleomargarine, Baked apples (karo), Top milk. Turkish pilaf with cooked meat (leftover), Brown nut sauce, Baked potatoes, Oleomargarine, Lima beasn, Scalloped Onions, Potato bread, Oleomargarine [second mention! ], Tomato jelly salad with Mayonnaise (Wesson oil). Stewed dried apricots, Oatmeal, top milk, Sugar, Coffee, Hot milk, Sugar, Potato bread, Apricot butter. Rolled oats 1 cup; Flour 1 cup; Sugar 3 tablespoons; Baking Powder 4 teaspoons; Salt ½ teaspoon; Milk 1 cup; Egg 1; Butterine 1 tablespoon. Scald milk, pour on rolled oats and let stand ½ hour before mixing. Mix and sift dry ingredients into the rolled oats and milk mixture. Add the slightly beaten egg and melted butter. Beat well and bake in greased muffin pans ½ hour in a moderately hot oven. Turkish Pilaf with Cooked Meat. Rice 2 cups cooked, Onion 1 small, Tomatoes 1 cup stewed, Water ½ cup, Salt 1 teaspoon, Meat 1 cup cooked pieces, Pepper ¼ teaspoon, Fat 1 ½ tablespoons. Cook ½ cup well washed rice in plenty of boiling salted water. Cut up onion, add tomatoes, seasoning, and meat. Put fat into frying pan, add above mixture, and rice and water. Cook one half hour. On Monday: All at sea with sausage. What science demands more study than Cookery? You have not only, as in other arts, to satisfy the general eye, but also the individual taste of the persons who employ you; you have to attend to economy, which every one demands; to suit the taste of different persons at the same table; to surmount the difficulty of procuring things which are necessary to your work; to undergo the want of unanimity among the servants of the house; and the mortification of seeing unlimited confidence sometimes reposed in persons who are unqualified to give orders in the kitchen, without assuming consequence, and giving themselves airs which are almost out of reason, and which frequently discourage the Cook. Louis Eustache Ude. Love the Old Foodie. You might enjoy these war posters, many of which have a food theme. Have to wonder if some of the surpluses of grain in the US, thence corn sweeteners, biggie fries, and big butts, date to this promotion of Big Ag. (You may need to download a plugin. Thanks for the site - I'm always looking for references. I think there must be a book in that idea "101 things to do with a grain surplus". What do you think?